Melville, NY USA……………At a recent Nassau Suffolk Water Commissioners’ Association (NSWCA) meeting hosted by Massapequa Water District Commissioners Thomas P. Hand, Joseph J. Tricarico and Raymond J. Averna in Williston Park, New York, the NSWCA recognized the contributions of the Hon. Jack M. Martins (Mineola, NY). 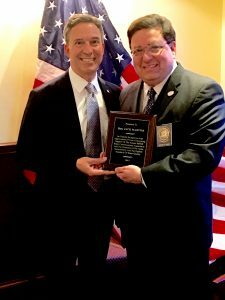 NSWCA President and Plainview Water Commissioner Andrew N. Bader presented Mr. Martins with a special plaque in appreciation of his support of NSWCA during his tenure as New York State Senator (2010-2016) from the 7th district. Commissioners from the 21 water districts that comprise the NSWCA were in attendance.